Check out the latest video - a 'review' of the new Richmond Adelaide bike lane extensions - by City Cyclist. It's great that Toronto is making some forward progress with added bike lanes and bike infrastructure. And anyone who lives in the city and looks around realizes that there are a growing number of cyclists, even in the winter. Again, I will stress that the bike lanes on Richmond and Adelaide are positive steps towards a minimum grid of bike lanes in the city, and our new protected bike lanes saw a 300 per cent increase in cyclists within the first year of the test period, so if you build it, we'll use it BUT...we could be smarter about the design of the bike lanes. What is wrong about the design of the new bike lanes? I'm glad you asked. First of all, bus stops are in the bike lane, so buses must cross into bike traffic, completely cutting off our safe cycling space in order to stop. Some bus drivers are courteous, giving cyclists time and space during this process. Others don't give a crap and bully you out of the way, effectively pushing cyclists out of the bike lane...and this can be very dangerous. One such bus cut off is in the video. This poor design for bus stops is evident every day when you ride along Richmond. This wouldn't be too hard to fix - the Sherbourne bike lane does a decent job with bus stops - the buses stop beside the bike lane; cyclist have to stop to yield for passengers, but the 40,000 pound buses never encroaches on the safety of the cyclists in the bike lane. Everyone shares. No one gets hurt. And another thing! Imagine driving in a car and making a right turn from the centre lane, crossing in front of, and fighting through, other cars who are going straight in the right lane. Stupid, right? 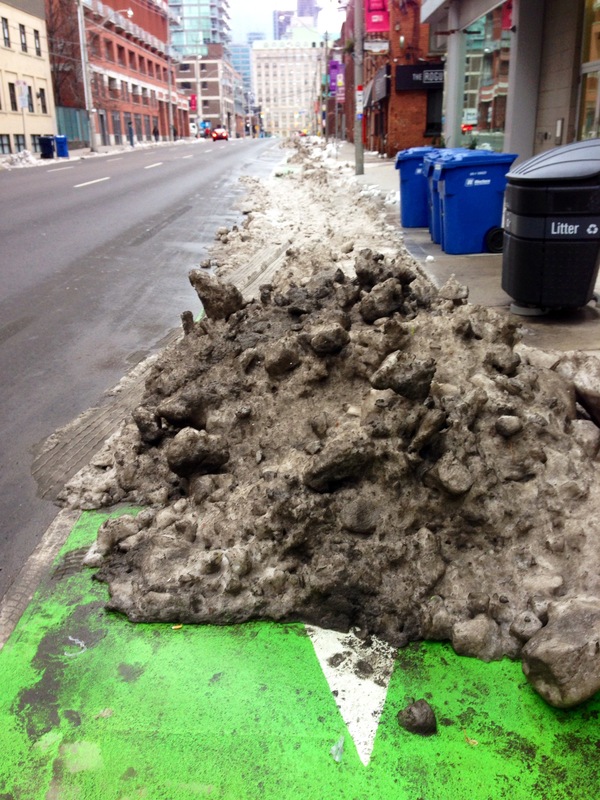 Welcome to Toronto city cycling. At intersections along the Richmond and Adelaide bike lanes, the last 50 feet or so is a free for all - cars are allowed to merge into the bike lane to turn right. Many are courteous and respectful. Some are complete douches, speeding past cyclists so that they can then cut off these same cyclists at the intersection, where they then block the bike lane because they have to wait for pedestrians who are crossing anyway, leaving the cyclists pissed off and forcing them to dangerously drive around them, or wait for the car to move while inhaling some tasty tailpipe at close range. (Hey, if we liked waiting in traffic all day like idiots, we'd be driving a car alone too.) Anyway, having to stop every block, or ride around cars and buses one way or another, is not an efficient (or particularly safe) system. Cycling is the most efficient way to get around the downtown core, but this right turn issue is a design flaw. Dear Denmark: Please advise us how we can fix this issue; we're a bit clueless. What else? Blocked bike lanes. A problem everywhere, I know, but having trucks and cars block the bike lanes, or even driving in them, negates the whole idea of having a space for cyclists to ride safely. Adelaide between York and Yonge is ridiculous: I bet the entire city budget shortfall could be made up by simply ticketing trucks and cars blocking the bike lane here. Is it an enforcement issue? Yes, in part, for sure. Is it a design issue? Maybe. It's also a cultural thing - it's selfish and disrespectful of others and it has a chain reaction effect - if a car or truck is blocking the bike lane, then the cyclist has to ride into traffic or, gasp(! ), onto the sidewalk to get around. 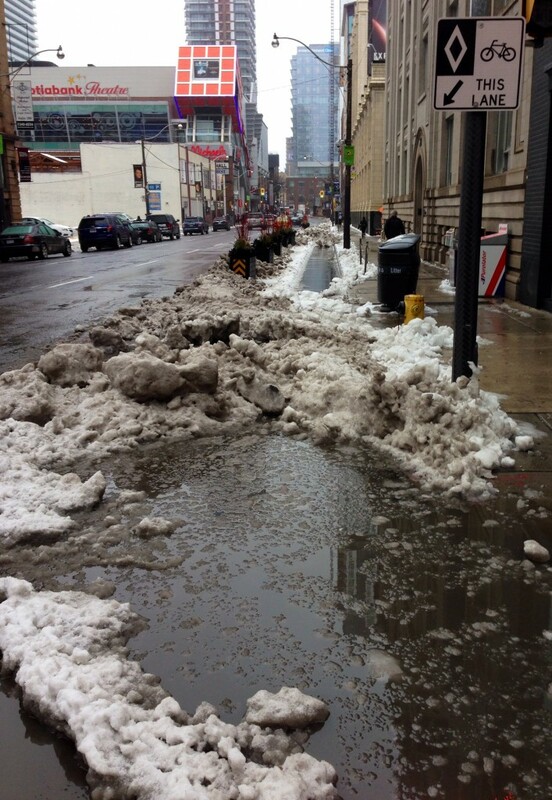 And while I’m on a roll… let’s talk about: Snow removal. Yes, snow removal...during a winter where we have had barely any snow, there are still bike lane snow removal issues, in spite of the added city budget and efforts. The main problem I see is at intersections and private driveways. The city will plow and salt the lanes, and then other trucks or car traffic will make such a mess of intersections that the bike lane is unusable. Or people will shovel snow into the lanes. 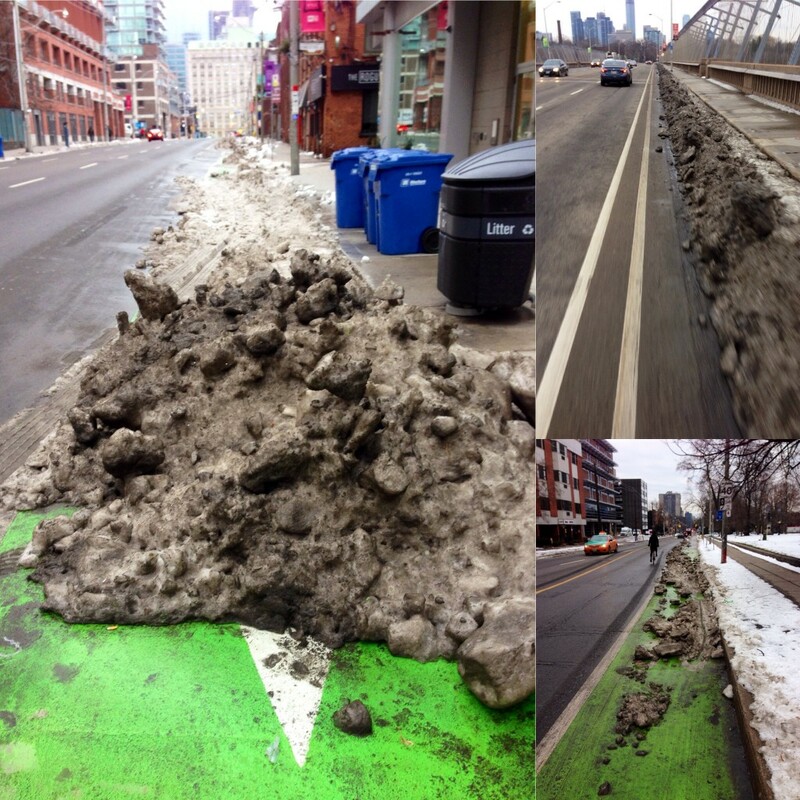 Right now it's a minor annoyance really, but when Toronto had our one significant snowfall earlier this winter, the Richmond bike lane was unusable for days in spots unless you dismounted every block and walked over the snow pile. Check out some of these photos taken at the end of December.